Alert students and employees to app and enrollment changes. 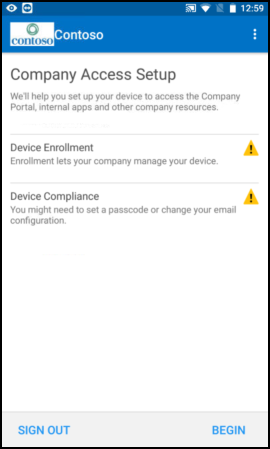 Update your organization's documentation or helpdesk procedures. 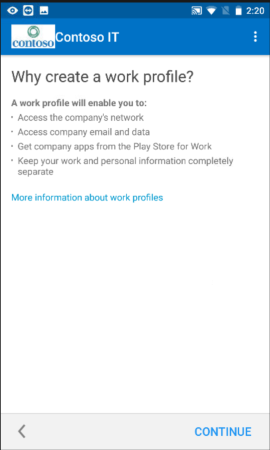 If you're an employee or student, be sure to check out the screenshots and links to the Company Portal help documentation. 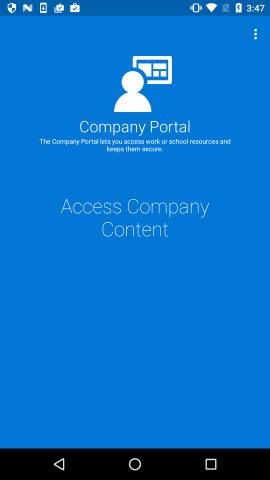 For more information about how to use the Company Portal app, see the Company Portal user help documentation. 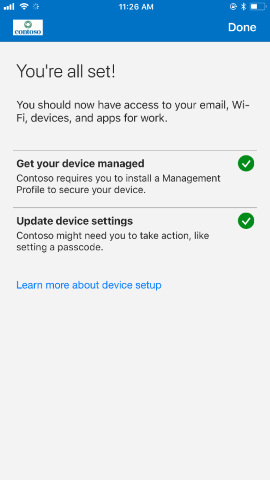 There's a new end-user app for Android fully managed devices called Microsoft Intune. 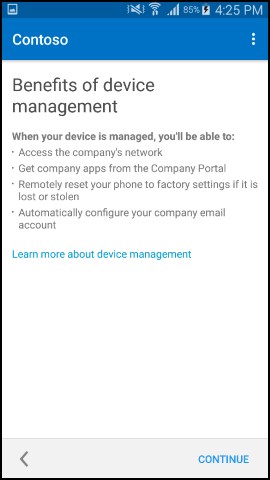 This new app is light-weight and modern, and provides similar functionally as the Company Portal app, but for fully managed, corporate devices. 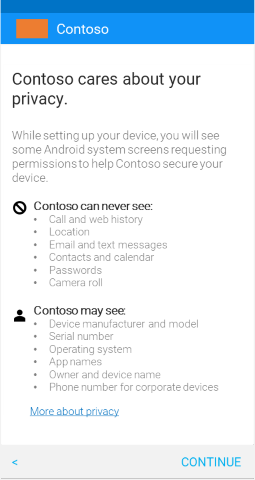 For more information, see Microsoft Intune app on Google Play. 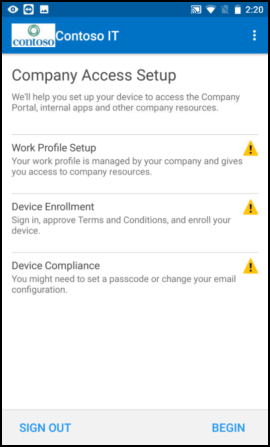 Allow Safari to open the Company Portal website and download the management profile before returning to the Company Portal app. 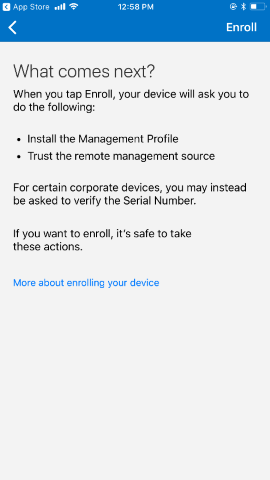 Open the Settings app to install the management profile on their device. 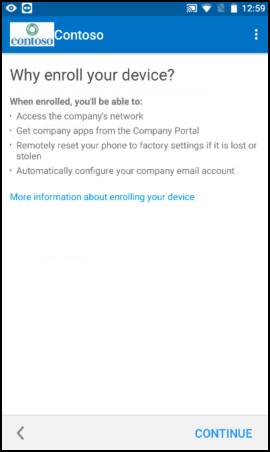 Return to the Company Portal app to complete enrollment. 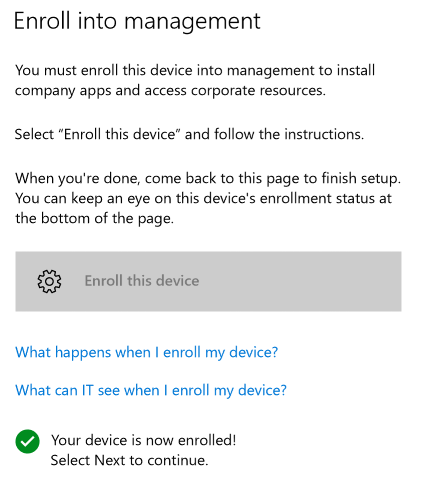 For updated enrollment steps and screens, see Enroll iOS device in Intune. 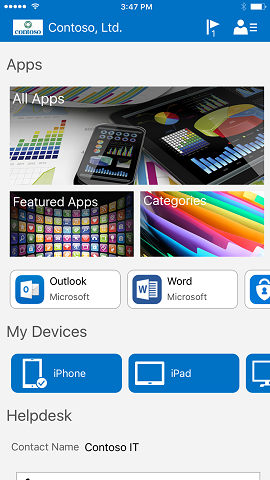 The home page of the Company Portal app for iOS devices has been redesigned. 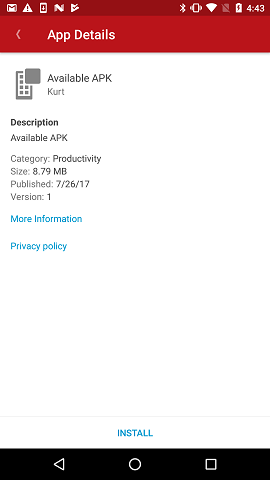 With this change, the home page will better follow iOS UI patterns, and also provide improved discoverability for apps and ebooks. 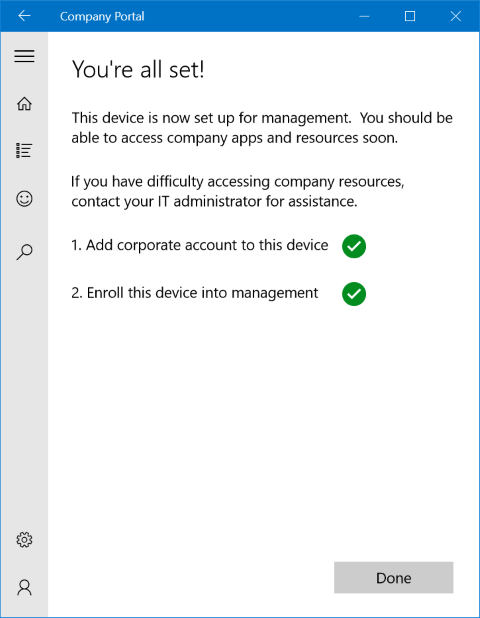 A new screen called App categories has been added to improve the app browsing and selection experience in Company Portal for Windows 10. 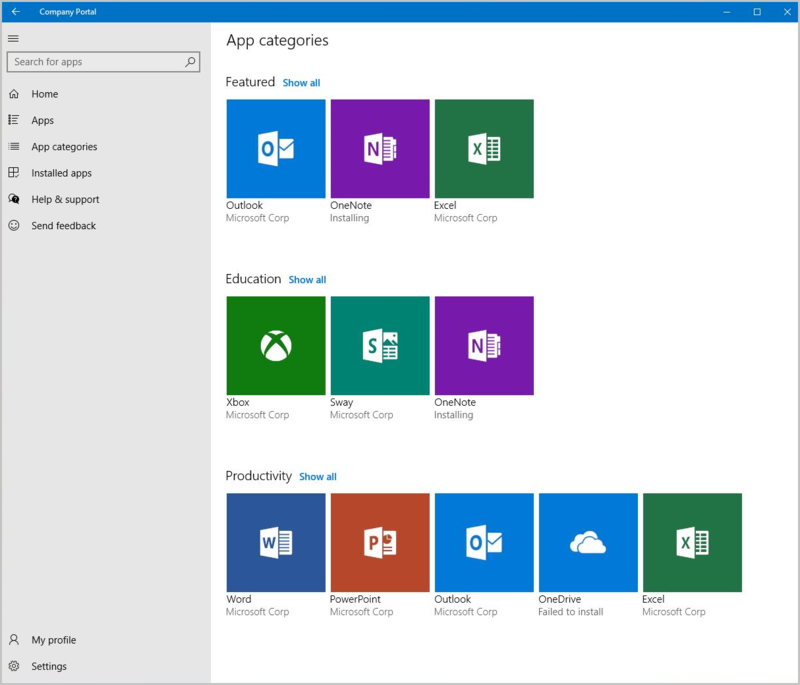 Users will now see their apps sorted under categories such as Featured, Education, and Productivity. 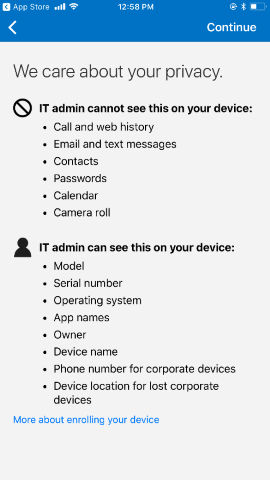 This change appears in Company Portal versions 10.3.3451.0 and later. 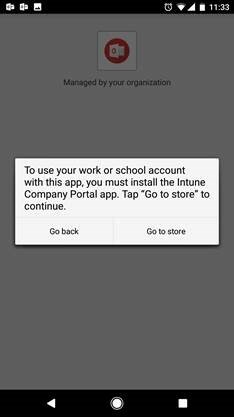 For more information about installing apps in Company Portal, see Install and share apps on your device. 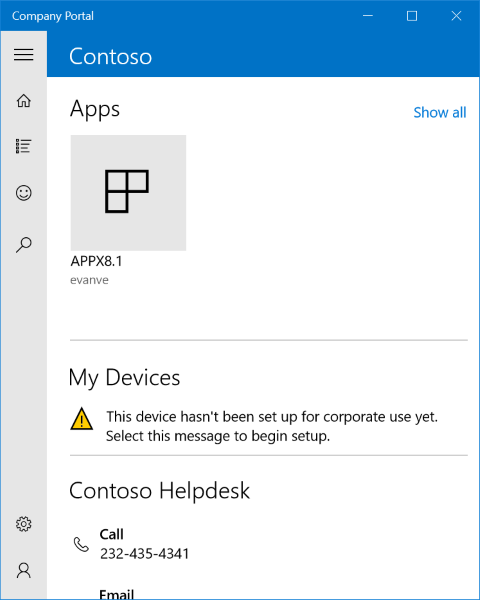 End users will now be able to trigger app and device actions in the Windows Company Portal using keyboard shortcuts (accelerators). 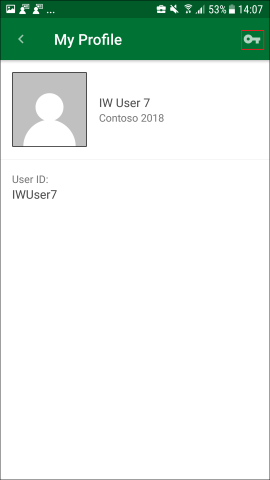 As the Microsoft Intune admin, you can upload a custom brand image which will be displayed as a background image on the user's profile page in the iOS Company Portal app. 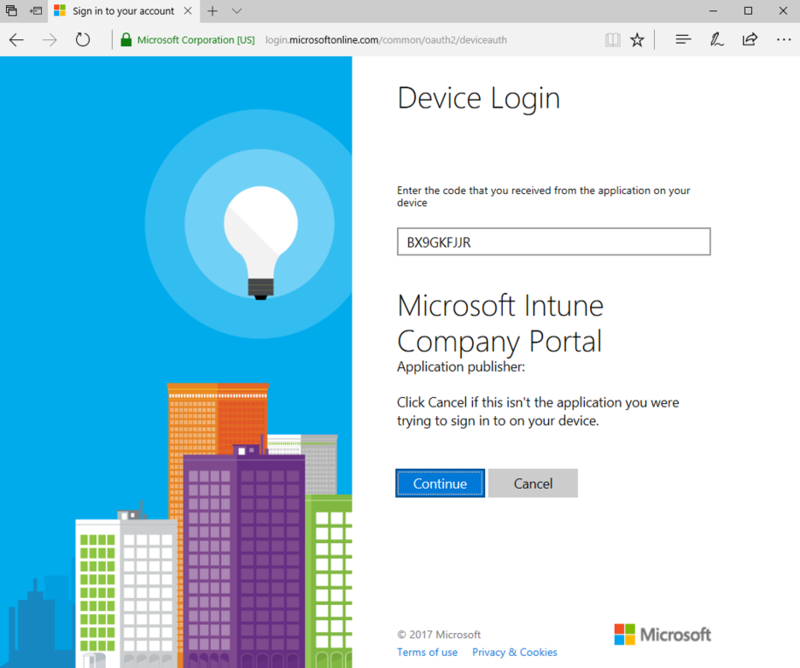 For more information about configuring the Company Portal app, see How to configure the Microsoft Intune Company Portal app. We’ve added new features, based on feedback from customers, to the Company Portal website. You'll experience a significant improvement in existing functionality and usability from your devices. 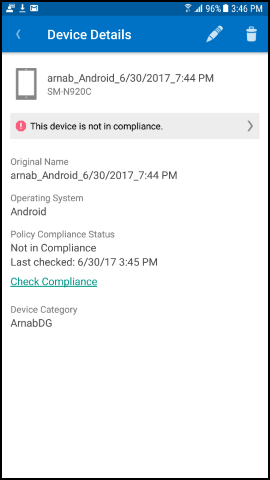 Specific areas of the site, such as device details, feedback and support, and device overview, now have a new, modern, responsive design. 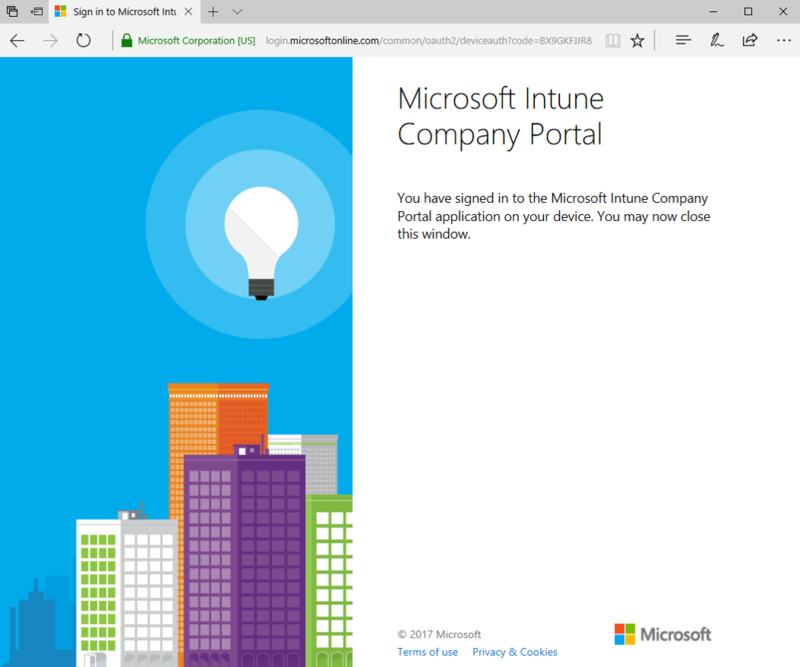 The Intune Company Portal website documentation has been updated to reflect these changes. 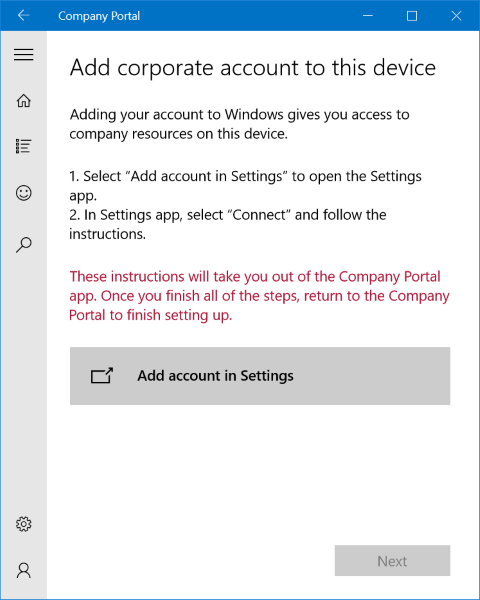 The Company Portal app for Windows now lets you initiate a sync directly from the Windows taskbar and Start menu. 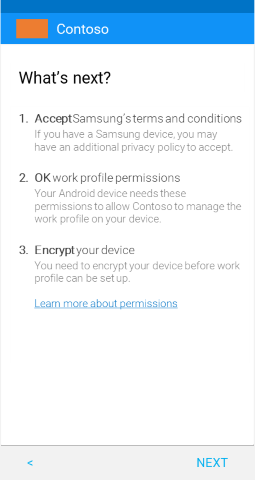 This feature is especially useful if your only task is to sync devices and get access to corporate resources. 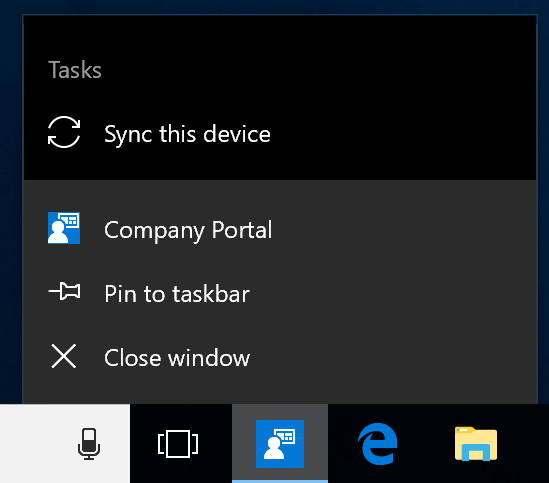 To access the new feature, right-click the Company portal icon pinned to your taskbar or Start menu. 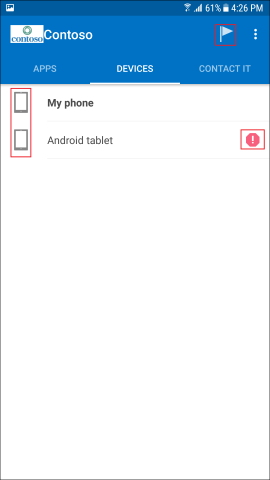 In the menu options (also referred to as a jump list), select Sync this device. 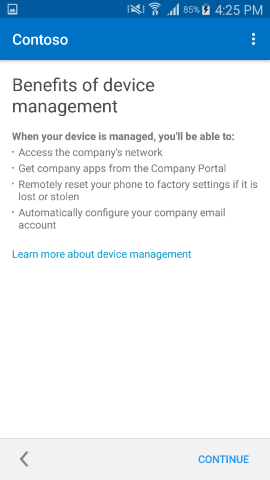 The Company Portal will open to the Settings page and initiate your sync. 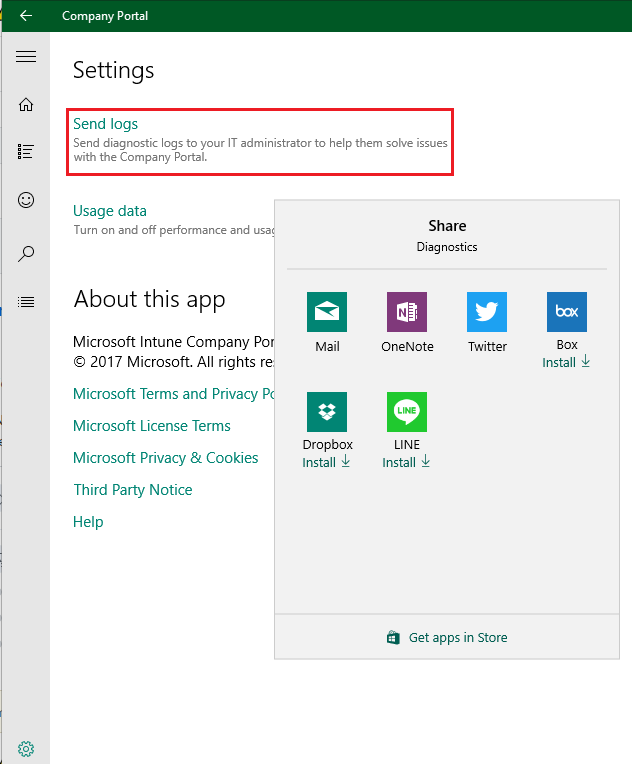 Now when browsing or searching for apps in the Company Portal app for Windows, you can toggle between the existing Tiles view and the new Details view. 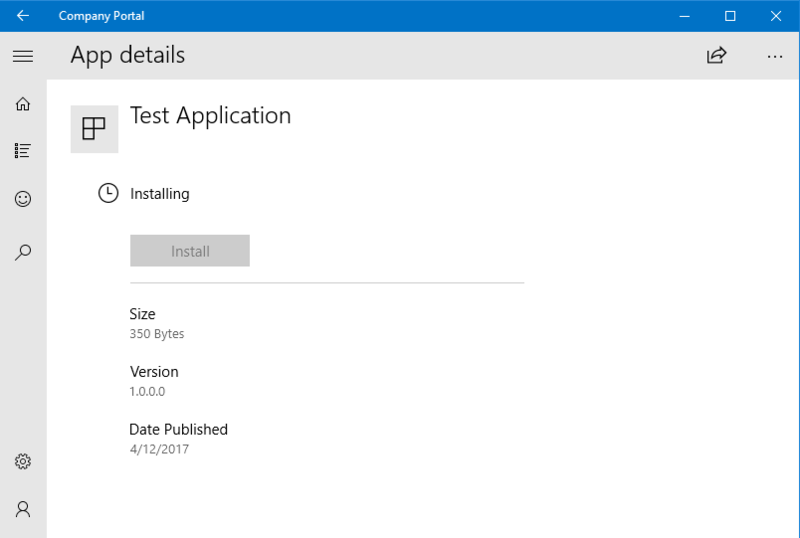 This new view lists application details such as name, publisher, publication date, and installation status. 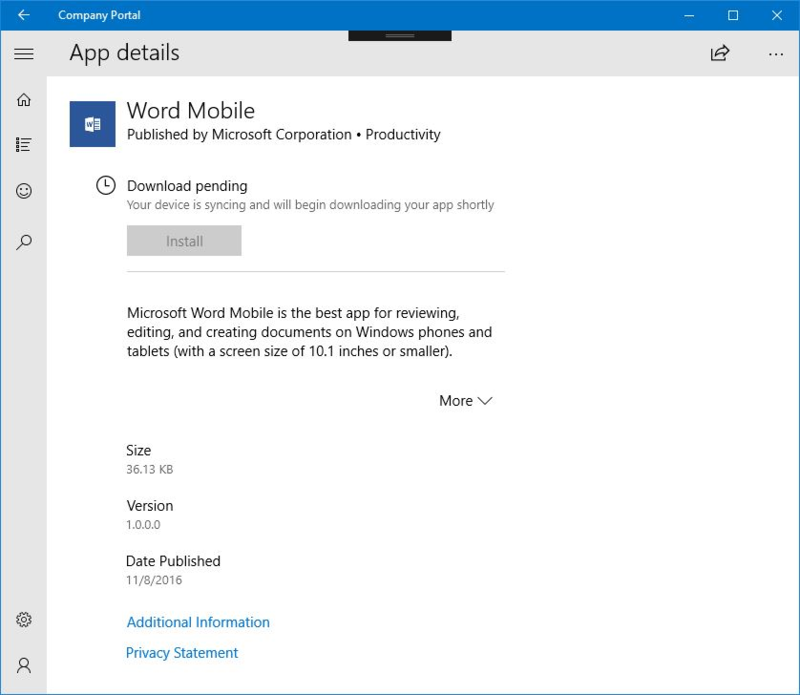 The Apps page's Installed view lets you see details about completed and in-progress app installations. 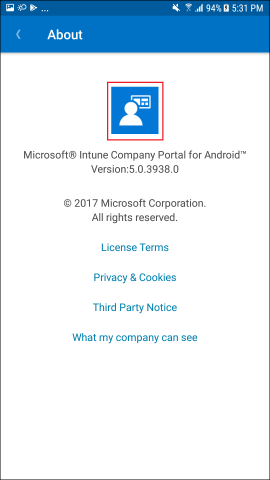 The Intune Company Portal app for Windows 10 has been updated with the Fluent Design System's navigation view. 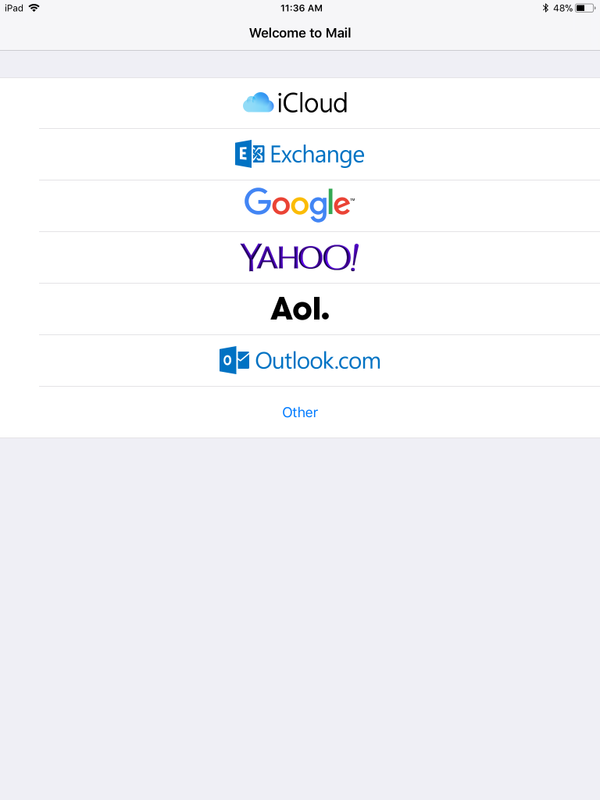 Along the side of the app, you'll notice a static, vertical list of all top-level pages. 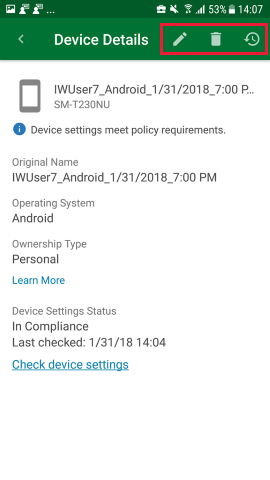 Click any link to quickly view and switch between pages. 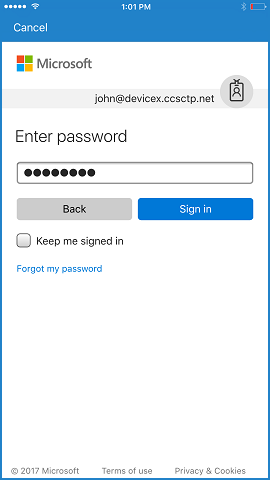 This is the first of several updates you'll see as part of our ongoing effort to create a more adaptive, empathetic, and familiar experience in Intune. 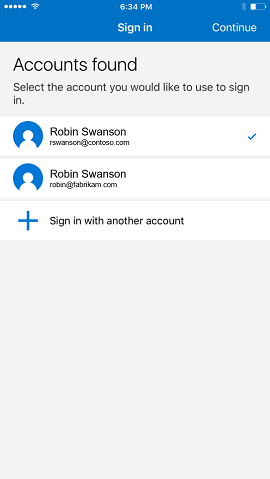 We've released a major user experience update to the Company Portal app for iOS. The update features a complete visual redesign that includes a modernized look and feel. 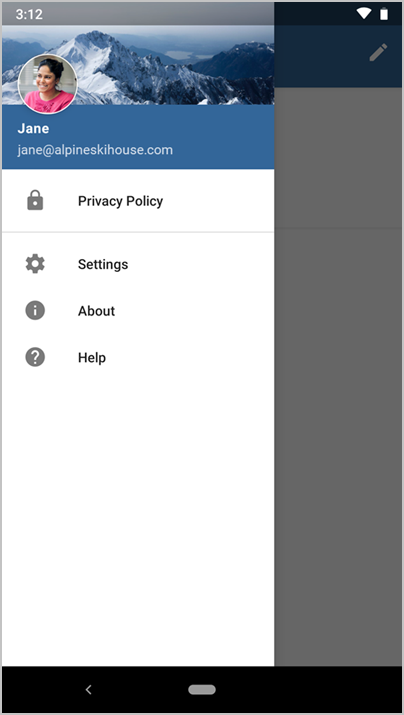 We've maintained the functionality of the app, but increased its usability and accessibility. 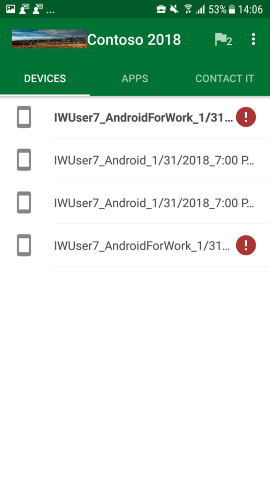 Faster app launch and loading responses, to save users time. 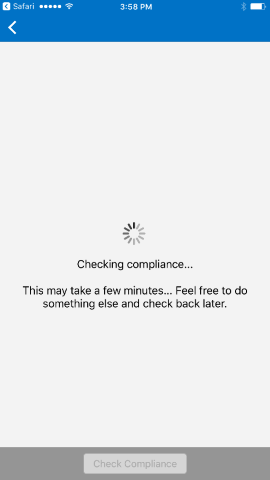 Additional progress bars to provide users with the most up-to-date status information. 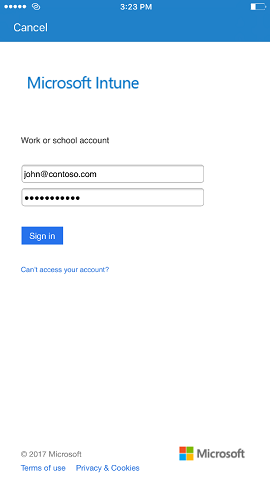 Improvements to the way users upload logs, so if something goes wrong, it's easier to report. 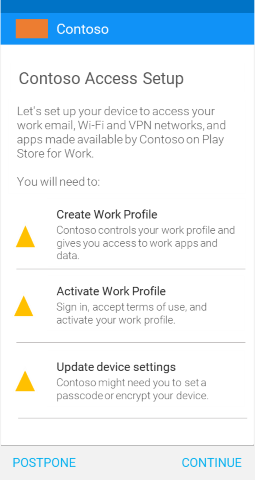 We've improved the language in the Company Portal for Windows 10 to be more user-friendly and specific to your company. 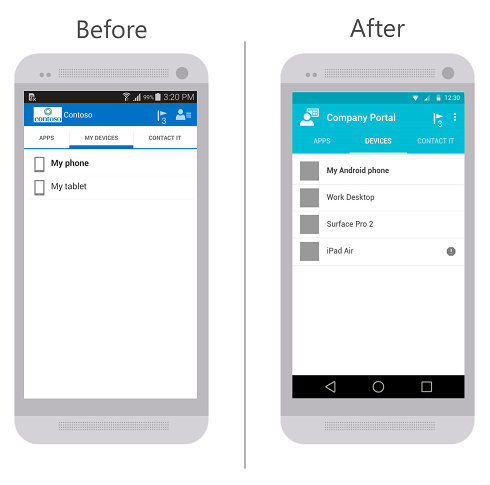 We've updated the Company Portal app for Android to follow Android's Material Design guidelines. 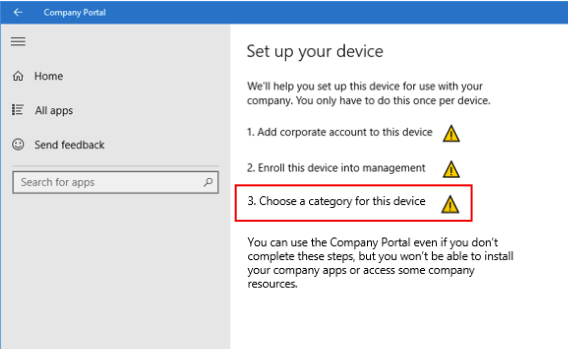 If you've enabled device group mapping, the Company Portal app for Windows 10 now walks your users through selecting a device category after enrolling their device. 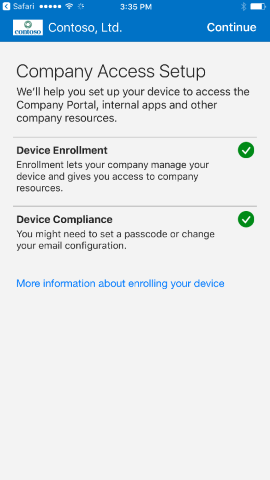 We've improved the device setup workflow in the Company Portal app for iOS. The language is more user-friendly and we've combined screens where possible. 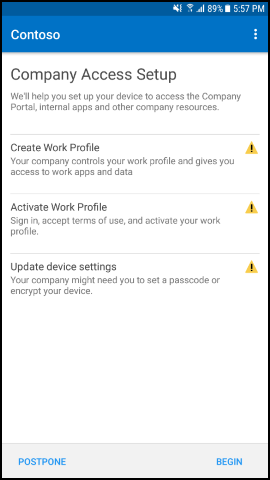 We have also made the language more specific to your company by using your company name throughout the setup text. 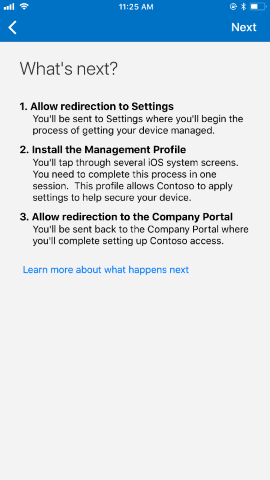 The Settings page in the Company Portal app for Windows 10 has been updated to make the settings and intended user actions to be more consistent across all settings. 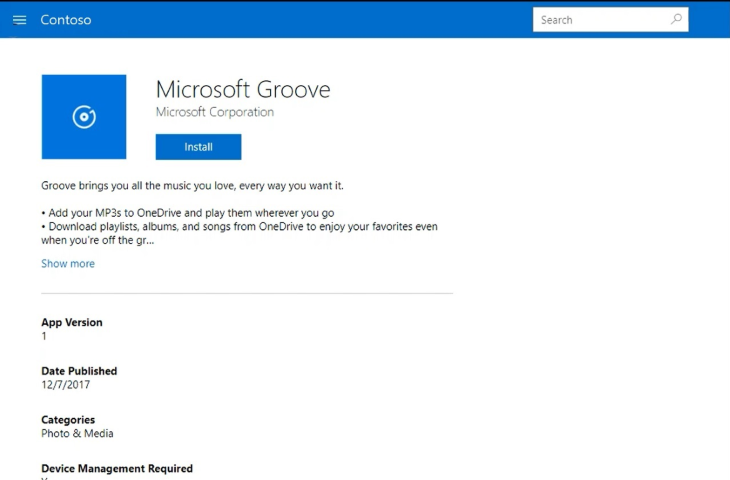 It has also been updated to match the layout of other Windows apps. 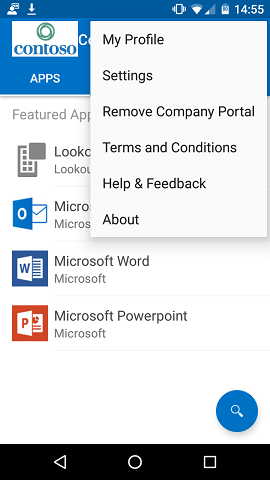 The Company Portal apps now use searches across app categories, names, and descriptions. The results are sorted in decreasing order of relevance. 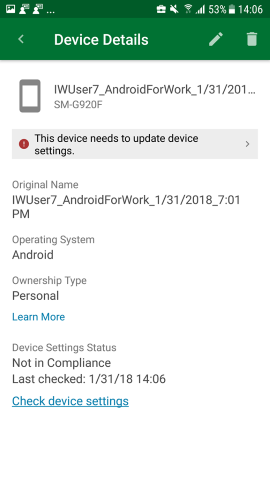 These updates are also available on the Company Portal website. We're still fine-tuning the way relevance is tracked, so please let us know how it's working using the "Feedback" link at the bottom of the Company Portal website. 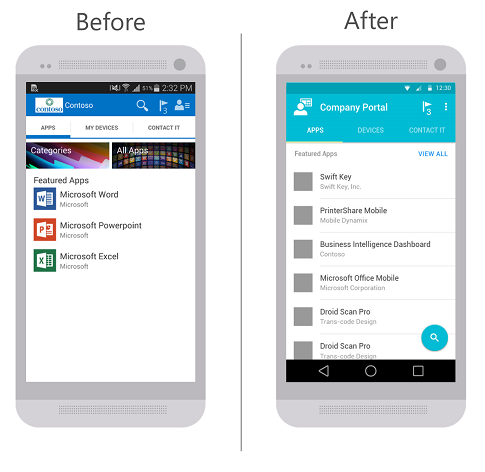 We're improving our app search capabilities, starting with the Company Portal website. 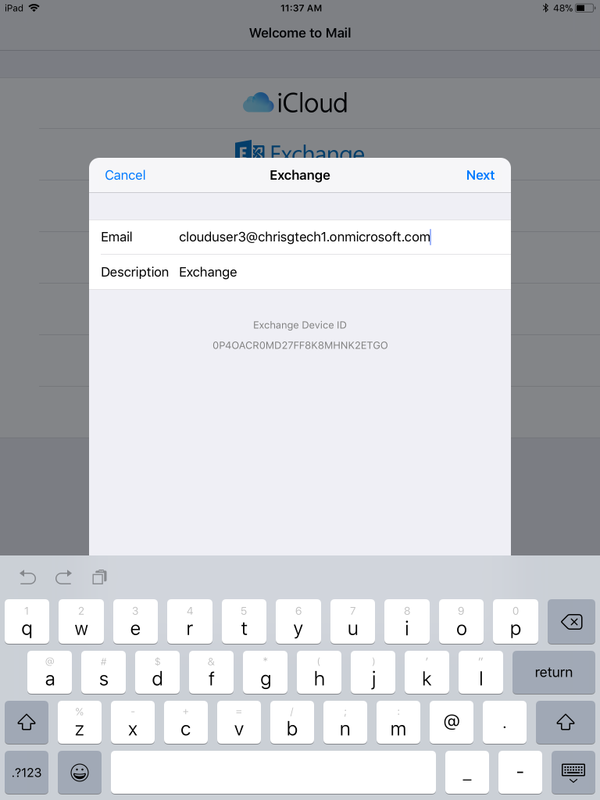 Searches will now be performed on app categories in addition to the Name and Description fields. The results will be sorted, by default, in decreasing order of relevance. 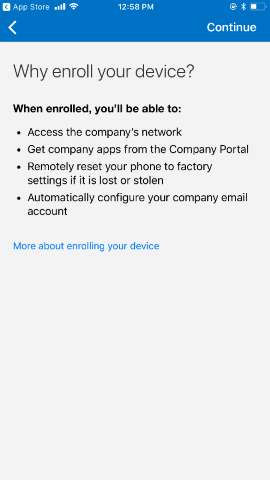 iOS users will also receive this change, as the Company Portal website is also used as part of the Company Portal app for iOS. 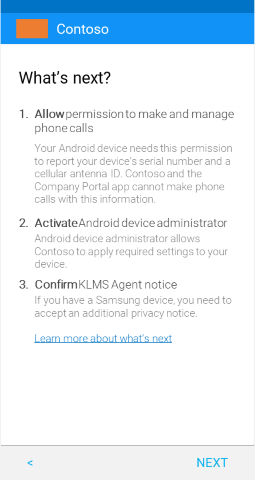 The Company Portal apps for Android and Windows will receive similar updates in the coming months. 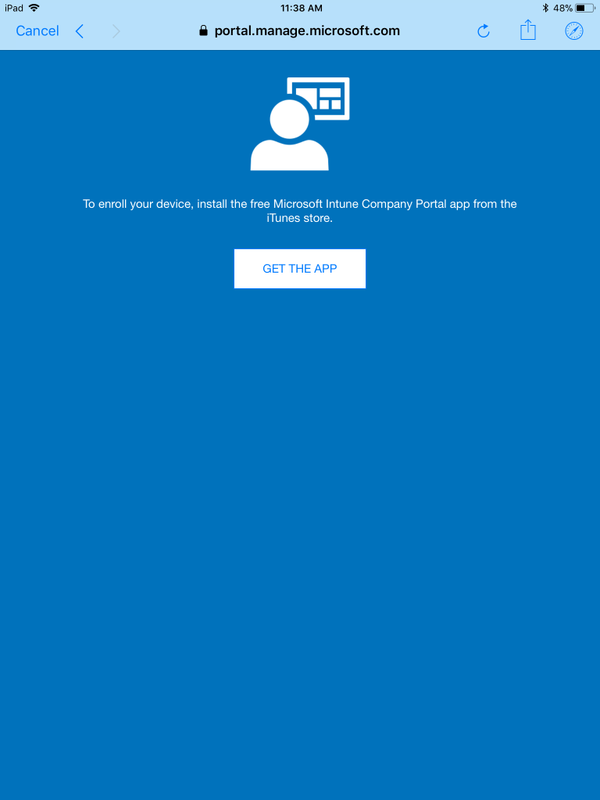 This release fixes a known issue with how the iOS Company Portal displays icons in the app tile. 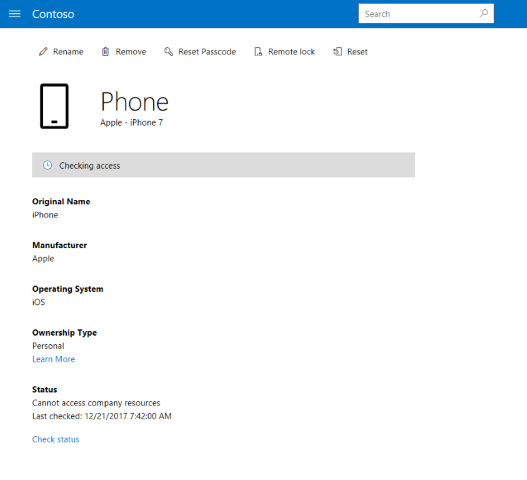 If you upload app icons of 120x120 pixels or larger, they now display in the Company Portal website and the iOS Company Portal's apps pages at the full size of the app tile. 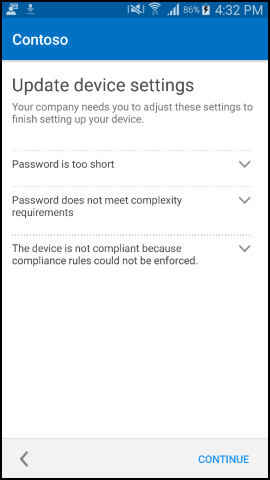 We've improved the device setup workflow in the Company Portal app for Android. 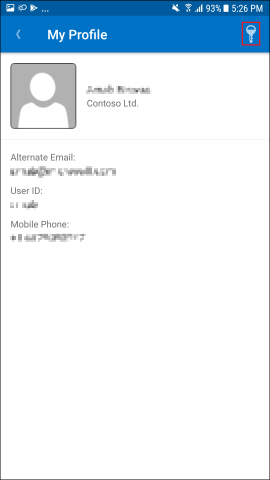 The language is more user-friendly and specific to your company, and we've combined screens where possible. 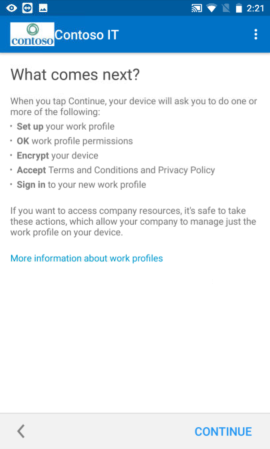 Additional steps have been improved on Android work profile devices. 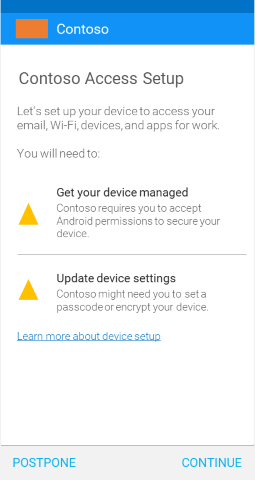 We've also updated the conditional access email activation screen. 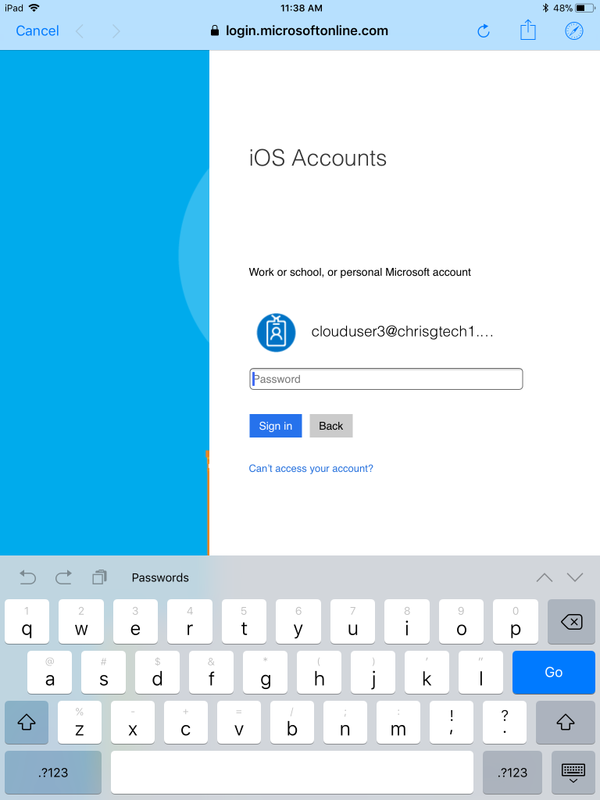 Conditional access with Intune supports more secure authentication on iOS devices with OAuth. 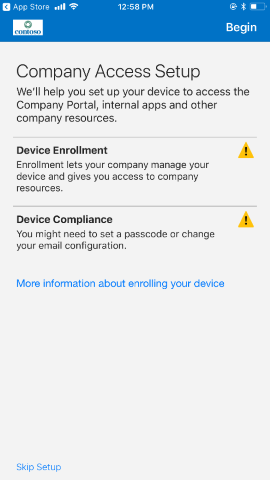 To support this, there will now be a different flow on the Company Portal app for iOS to allow for more secure authentication. When end users try to sign in to a new Exchange account in the Mail app, they will see a web view prompt. 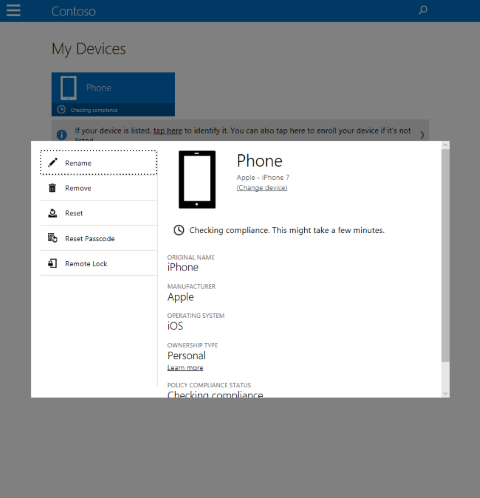 Upon enrollment in Intune, users will see a prompt to allow the native Mail app to access a certificate. 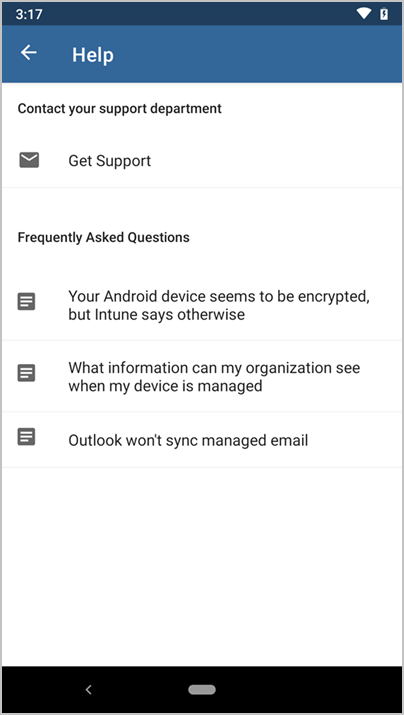 Most end users will not see any more quarantined emails. 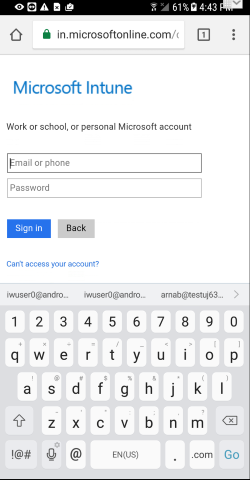 Existing mail accounts will continue to use basic authentication protocol, so these users will still have quarantine emails delivered to them. 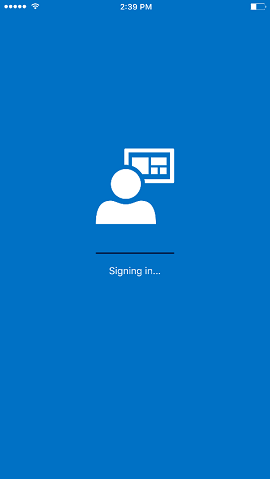 This sign in experience for end users is similar to the one on Office mobile apps. 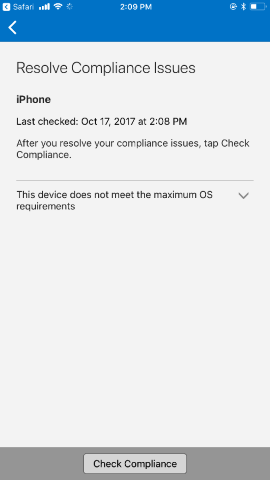 Intune Mobile Application Management (MAM) dialog boxes will be updated to a modern look and feel. The dialog boxes will function in the same way as the previous style. 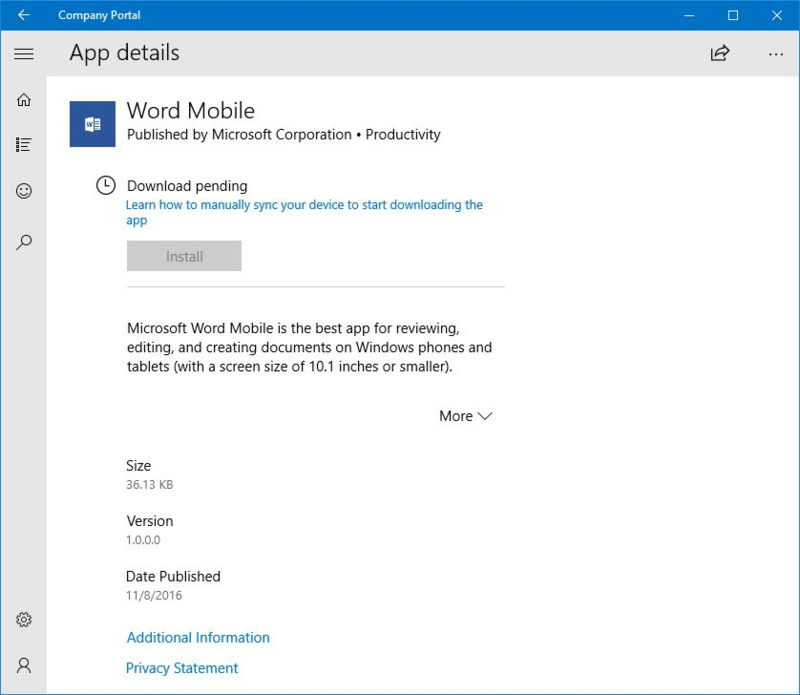 The Company Portal app for Windows 10 is moving the Category tag from below the title to a property on the Device Details page. 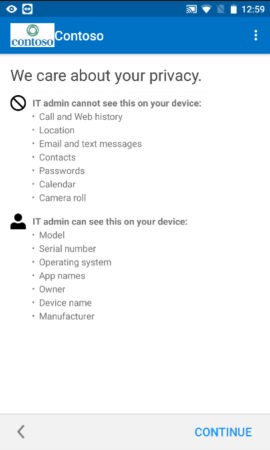 The apps details page of the Company Portal app for Android will now display the app categories that the IT admin has defined for that app. 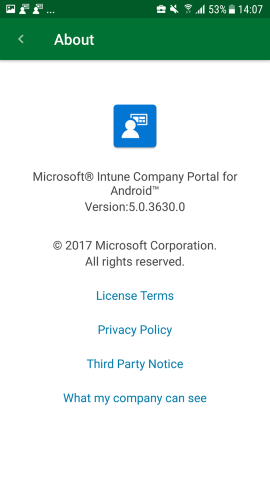 We are announcing a change that is coming in the next few months that will improve the sign-in experience for the Intune Company Portal apps for Android, iOS, and Windows. 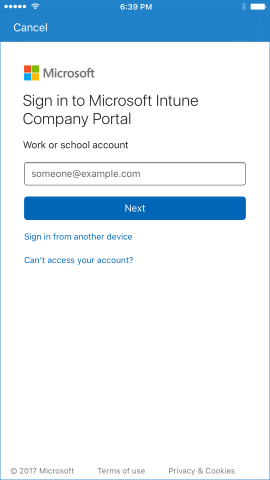 The new user experience will automatically appear across all platforms for the Company Portal app when Azure AD makes this change. 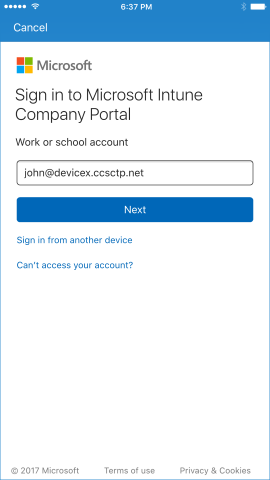 In addition, users can now sign in to the Company Portal from another device with a generated, single-use code. 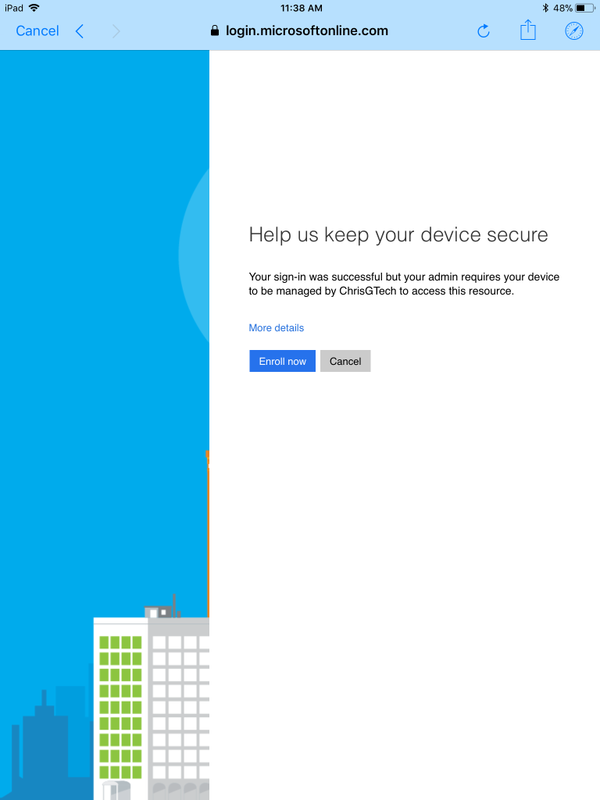 This is especially useful in cases when users need to sign in without credentials. 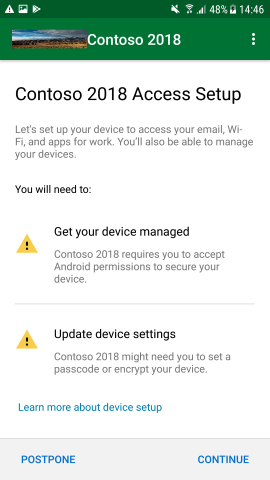 Below you can see the previous sign-in experience, the new sign-in experience with credentials, and the new sign-in experience from another device. 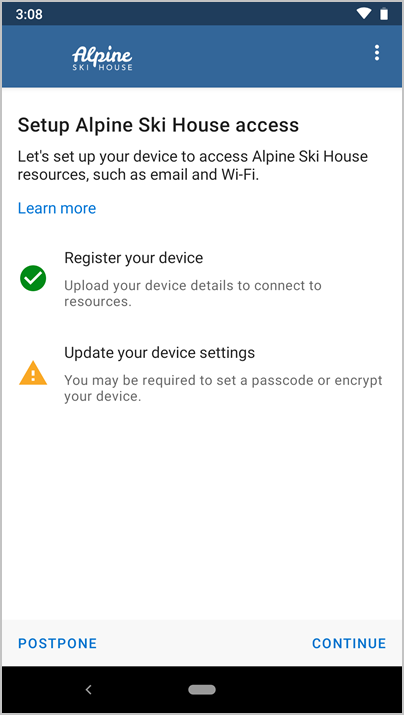 Tap the Sign-in from another device link. 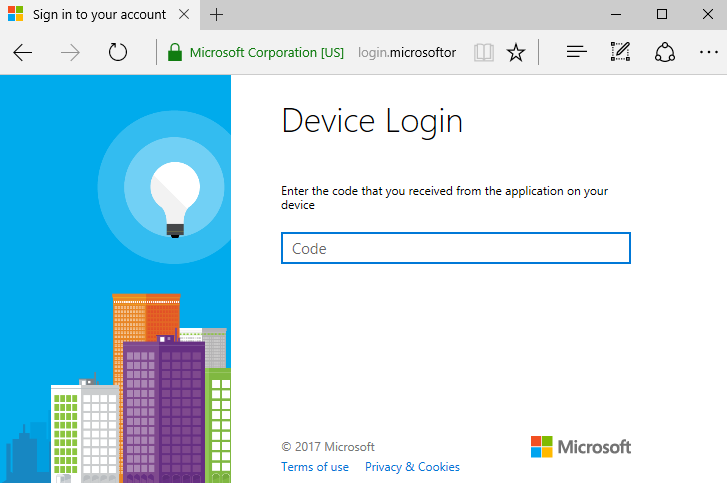 Launch a browser and go to https://aka.ms/devicelogin. 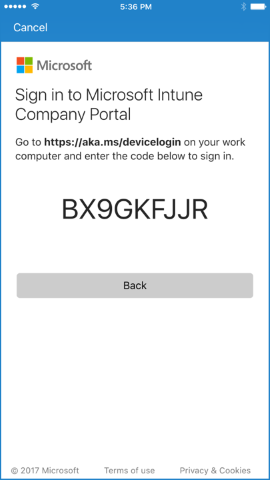 Enter the code you saw in the Company Portal app. 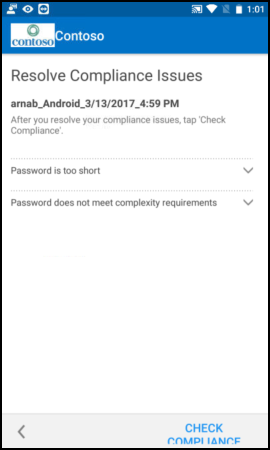 When you select Continue, you will be able to authenticate in the using any method that is supported by your company, such as a smartcard. 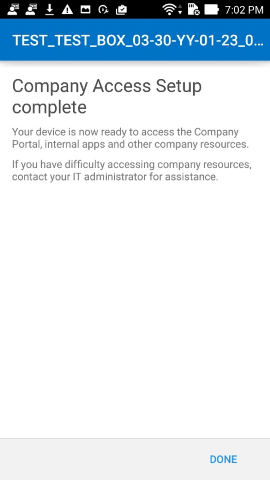 The Company Portal app will begin signing in. 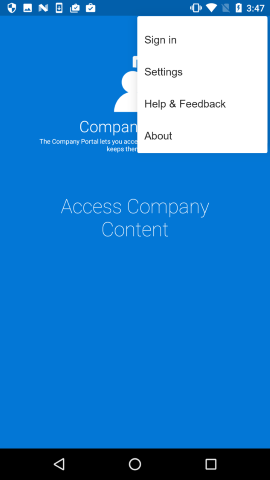 Based on customer feedback, we've modified the Company Portal app for Android to show an Access Company Content button. 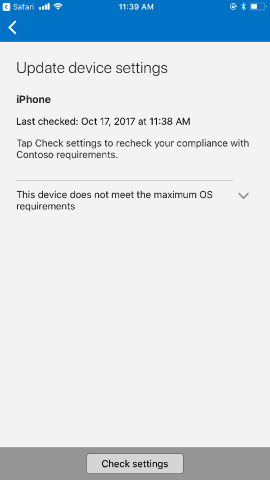 The intent is to prevent end users from unnecessarily going through the enrollment process when they only need to access apps that support App Protection Policies, a feature of Intune mobile application management. 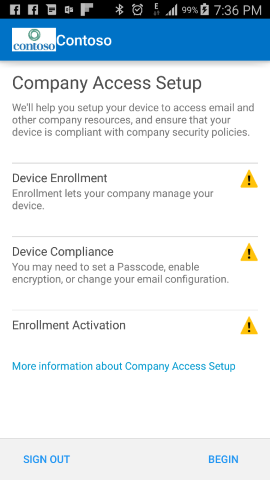 The user will tap on the Access Company Content button instead of beginning to enroll the device. 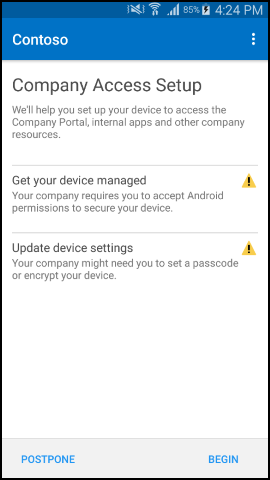 The user then is taken to the Company Portal website to authorize the app for use on their device, where the Company Portal website verifies their credentials. 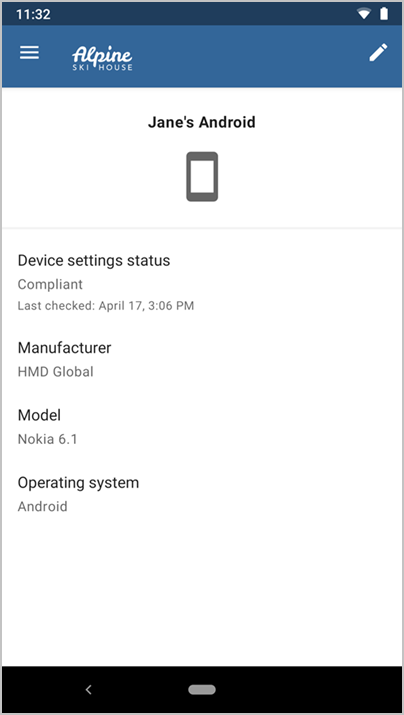 The device can still be enrolled into full management by tapping on the action menu. 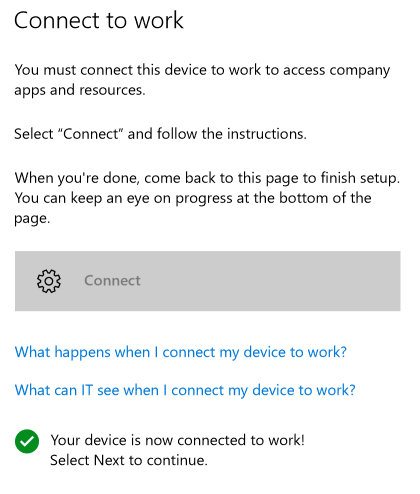 The Company Portal app for Windows 10 will now automatically initiate a sync for app install requests for devices with Windows 10 Creators Update (version 1703). 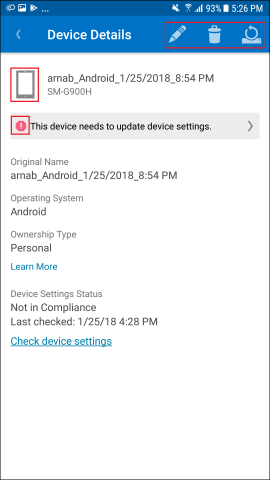 This will reduce the issue of app installs stalling during the "Pending Sync" state. 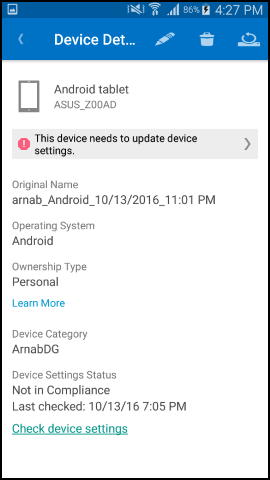 In addition, users will be able to manually initiate a sync from within the app. 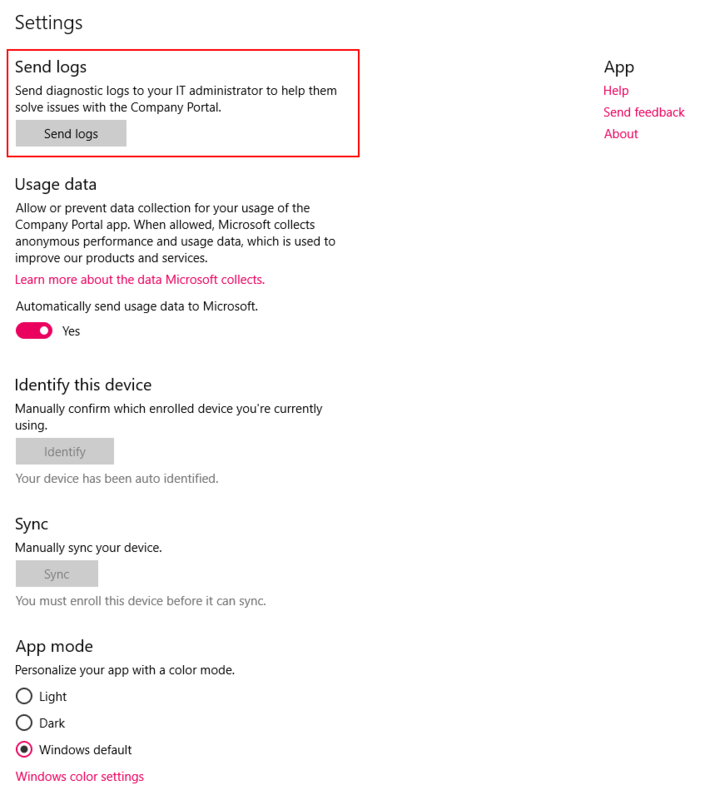 The Company Portal app for Windows 10 will include a guided Intune walkthrough experience for devices that have not been identified or enrolled. 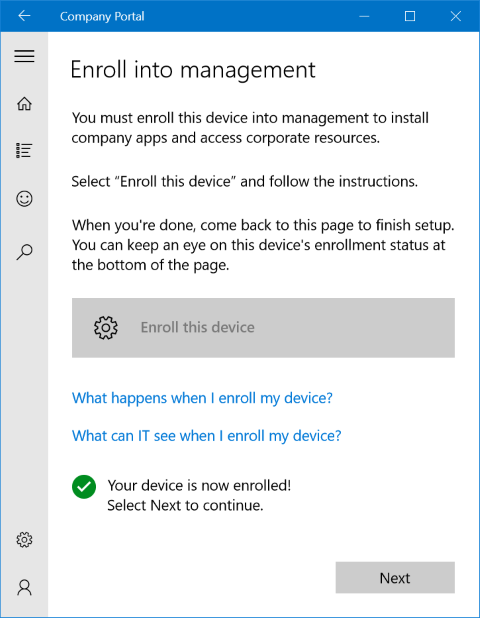 The new experience provides step-by-step instructions that guide the user through registering into Azure Active Directory (required for Conditional Access features) and MDM enrollment (required for device management features). 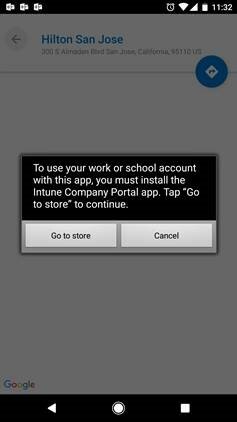 The guided experience will be accessible from the Company Portal home page. Users can continue to use the app if they do not complete registration and enrollment, but will experience limited functionality. 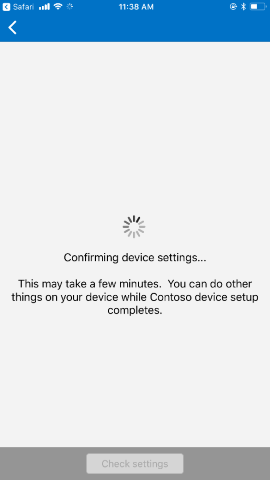 This update is only visible on devices running Windows 10 Anniversary Update (build 1607) or higher. 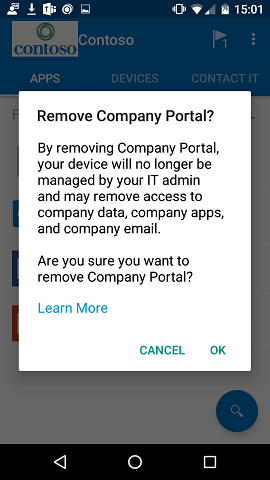 Based on user feedback, the Company Portal app for Android has added a new menu action to initiate the removal of Company Portal from your device. 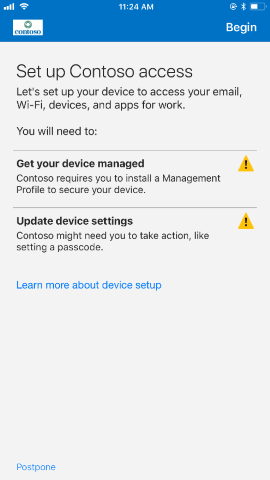 This action removes the device from Intune management so that the app can be removed from the device by the user. 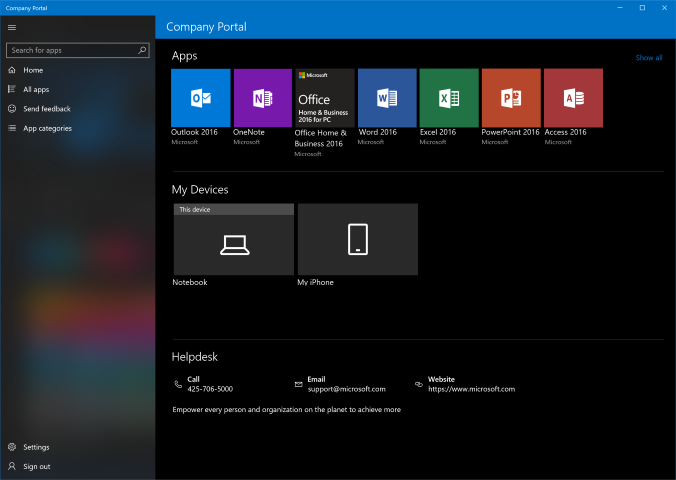 We updated the design of the app tiles on the homepage to reflect the branding color you set for the Company Portal. 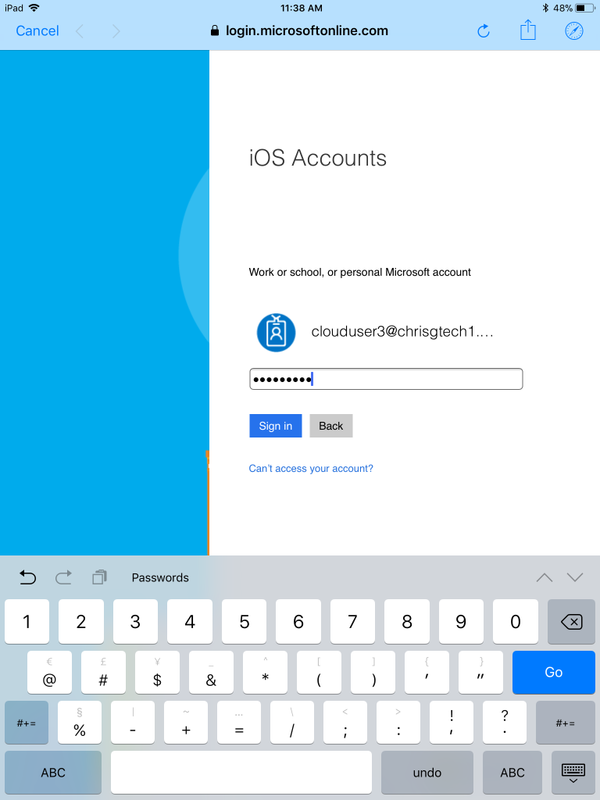 If users have used their work or school account to sign in to other Microsoft apps on their iOS device, then they may see our new account picker when signing into the Company Portal for the first time. 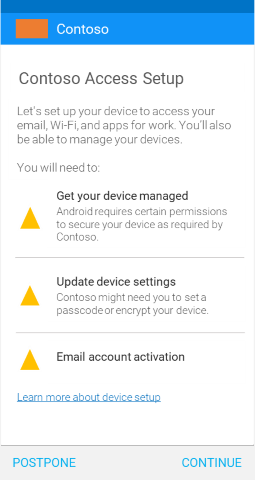 The Managed Browser is receiving updated icons for both the Android and iOS versions of the app. The new icon will contain the updated Intune badge to make it more consistent with other apps in Enterprise Mobility + Security (EM+S). 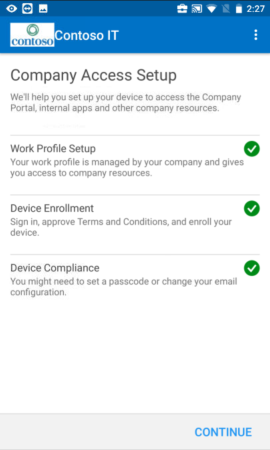 The Company Portal is also receiving updated icons for the Android, iOS, and Windows versions of the app to improve consistency with other apps in EM+S. These icons will be gradually released across platforms from April to late May. 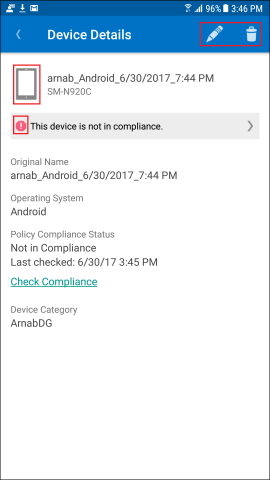 An update to the Android Company Portal app shows a sign-in progress indicator when the user launches or resumes the app. 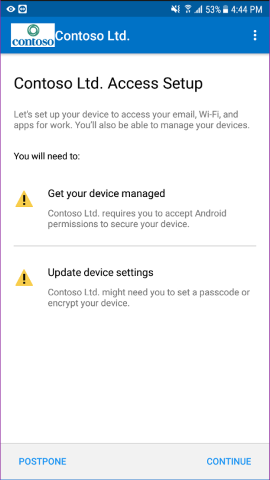 The indicator progresses through new statuses, beginning with "Connecting...", then "Signing in...", then "Checking for security requirements..." before allowing the user to access the app. 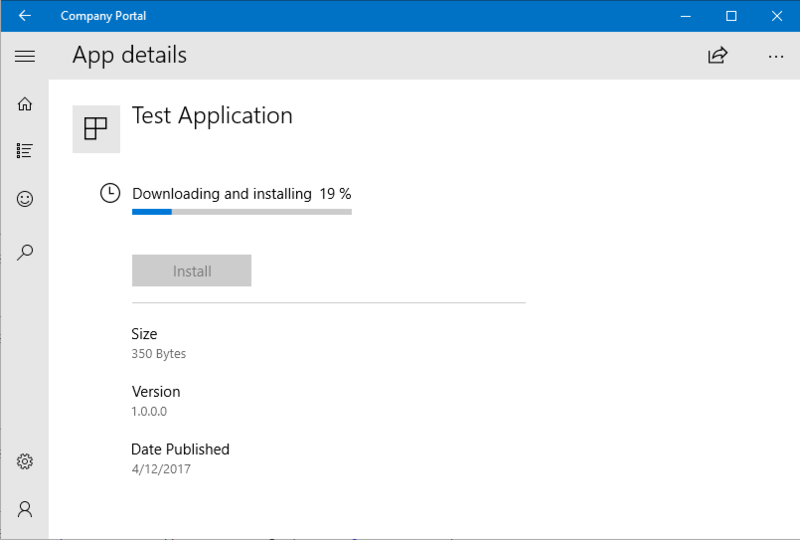 The Windows 10 Company Portal app now provides an install progress bar on the app details page. 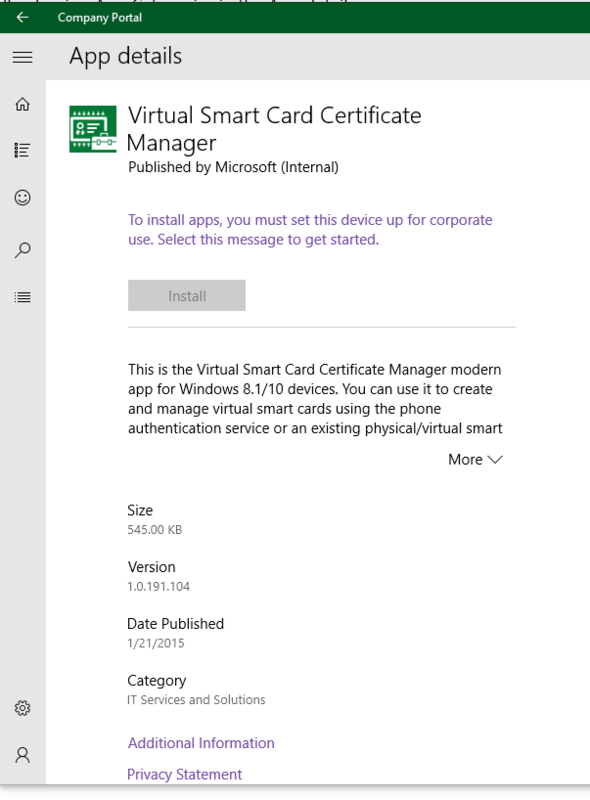 This is supported for modern apps on devices running the Windows 10 Anniversary Update and up. Colors: tab headers can be colored according to your custom color palette. 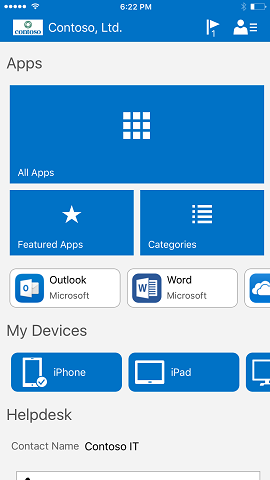 Interface: Featured Apps and All Apps buttons have been updated in the Apps tab. The Search button is now a floating action button. 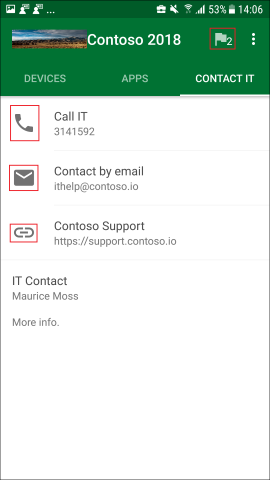 Navigation: All Apps shows a tabbed view of Featured, All and Categories for easier navigation. 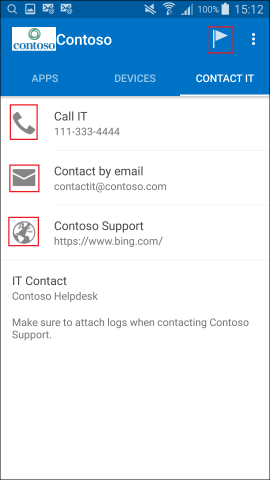 Contact IT has been streamlined for improved readability. 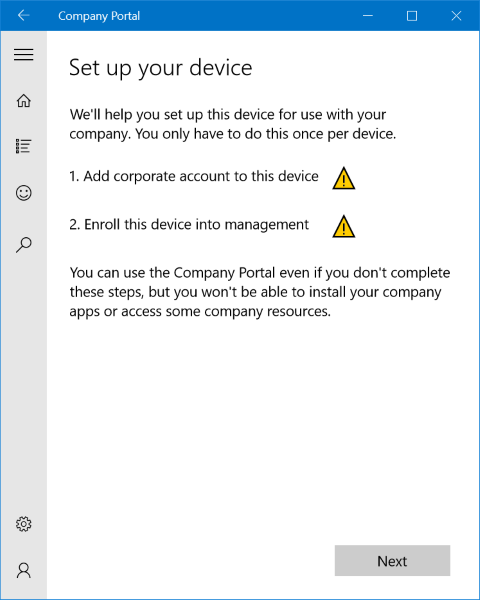 Beginning in February, the Company Portal website will support apps that are targeted to users who do not have managed devices. 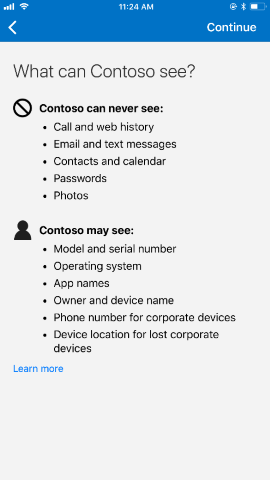 The website will align with other Microsoft products and services by using a new contrasting color scheme, dynamic illustrations, and a "hamburger menu," which will contain helpdesk contact details and information on existing managed devices. 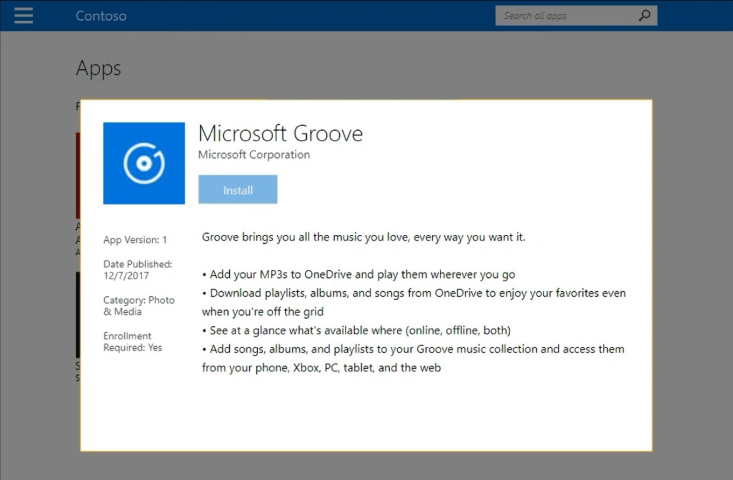 The landing page will be rearranged to emphasize apps that are available to users, with carousels for Featured and Recently Updated apps. These are the plans for ways we will be improving the user experience by updating our user interface. The images below may be previews, and the announced product may differ from the presented versions.